Grim Fandango Remastered features a new graphic setting with improved lighting and textures, which can be toggled on and off with a button press. 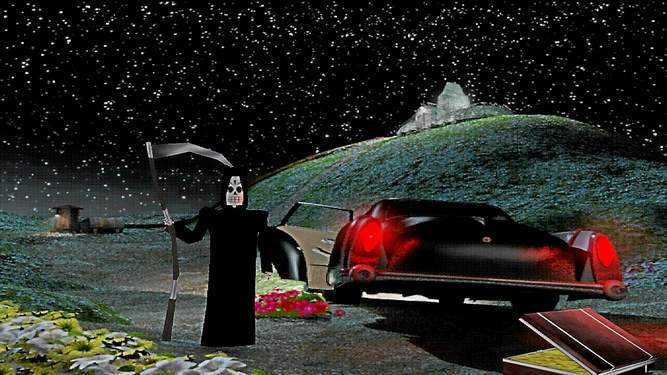 Originally released in 1998, Grim Fandango is often considered to be one of the classics of the adventure game genre, but for years it was difficult to find. At long last, the legal hurdles have been cleared, and a remastered version has been released by the original game’s creator, Tim Schafer, and the people at his new studio, Double Fine. But does one of the classic LucasArts titles hold up to the legacy it’s built over 17 years? I approached Grim Fandango Remastered as a new player, having never tried the original release. While Double Fine has dusted off the old title and given it a shiny new finish, some of the dated mechanics have still gotten rusty over the years. The story is as fresh and unique today as it ever was. Taking place in a Mexican Day of the Dead-inspired afterlife, you control Manny Calavera, a travel agent who helps shepherd the recently deceased to the Ninth Underworld by arranging transportation for them. The better a person was in their life, the faster they can get to the next world, using various methods of conveyance, including taking the luxurious Number Nine Express train. Manny himself is working off some of his karma by helping others, but when even his most immaculate clients are relegated to walking to their final destination, Manny stumbles into a huge conspiracy ripped straight from film noir like The Maltese Falcon or Casablanca. The characters all appear as charro skeletons, the environments borrow equally from Aztecan architecture and ‘30s Art Deco designs, and the voice acting impeccably brings the memorable characters to life, at times being genuinely touching while maintaining a great sense of humor. Even after so much time, there’s still nothing like this in the world of video games. The story features a colorful cast of characters many of which are comedic versions of film noir archetypes. Most of the cast is depicted as charro skeletons, but are still full of personality. You can’t really be faulted for getting stumped, but don’t look for an in-game hint system of any kind; Grim Fandango pre-dates helpful features like that. One feature that was added is the option to play the game with its original, pixelated graphics, or a new remastered mode, which features improved lighting and textures. To see how much the games has improved, you can flip back and forth between the two settings with the touch of a button. In my experience with the game, the remastered mode seemed to create some technical hitches, causing backgrounds to not appear, or sometimes causing the game to simply crash. Patches since the game’s release have improved these problems, but I still recommend saving often to avoid losing progress with a sudden crash. Alternatively, turning off remastered mode solves these problems completely. Another additional feature is the brand new developer commentary, where Tim Schafer and others who had a hand in creating the game will offer their insight into whatever area you happen to be when you touch a button. These little tidbits of inside information are a lot like the commentary on a DVD; they’re fascinating if you have any interest into how the sausage gets made, but can also get technical at times. 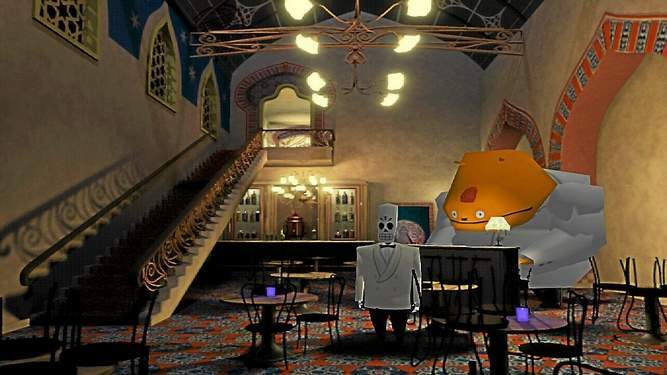 Grim Fandango is still a worthwhile experience for those who’ve never tried it. The story is excellent, but some obtuse puzzles act as roadblocks to experiencing it. Having the help of a guide may make the experience less frustrating for those who get stumped. Grim Fandango Remastered is available on Steam and the Playstation Network for $14.99. Double Fine provided a review code for the purposes of this article.